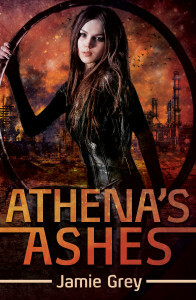 Today is the release day for ATHENA’S ASHES, the sequel to THE STAR THIEF! I’m so excited that it’s finally here. I loved continuing Renna’s story and digging deeper into her world, and I hope you all like it as well! As of right now, Athena’s Ashes is available on all major sites except Amazon US. Evidently they’re still working out a glitch that’s affected a lot of authors. But that doesn’t mean you can’t get your copy! I’ve included links below for everywhere else it’s live. And if Amazon’s your preferred retailer, I’ll let you all know as soon as it’s up! As part of the blog tour, there are two contests you can enter, too! Make sure to scroll down to the rafflecopter below. You could win paperback copies of the whole series, some fun swag, and even an Amazon gift card! I’m also hard at work on my next series – a spin off set in the same universe as The Star Thief, but that follows a new group of people working for MYTH. I’m having a ton of fun writing it so far, and I can’t wait to share it with you all when I have a bit more info. I’m really excited to be working with the Unofficial Addiction Book Fan club again for the blog tour. They’ve got a great giveaway going on for Athena’s Ashes. Scroll down to the end of the post to enter!